We love sacred spaces. We seek out places that vibrates with energy, where it is easy to get into the zone. We travel to such spots. Sometimes, long distances: the shala in Mysore, India; to favorite teachers, who have put a lot of love in their teaching spaces; to exotic locations around the world. The real challenge, however, is to practice anywhere. To be able to lay your mat down wherever you land, whatever space is available. Then, there’s the “practice” that the practice prepares you for. The one that happens in gridlock in the middle of a commute, in the middle of a crazy work day, or amidst a rowdy bunch of party-goes or protesters or people in general. Always, we find ourselves in the middle, sandwiched between opposing forces, the occasion challenging/inspiring us to breathe, to steady ourselves, to find our center. And practice happens. It comes naturally, a reflex, a response system. Real life, day-to-day yoga. 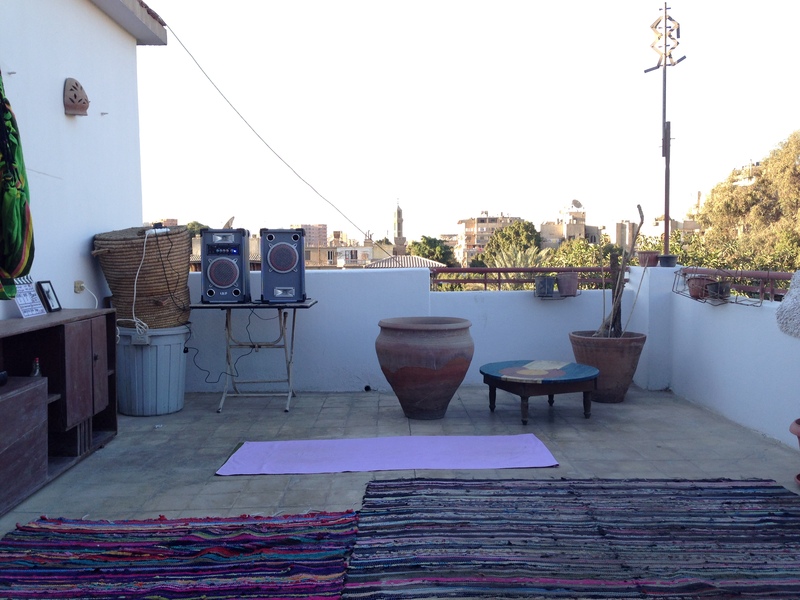 Photo: My friend’s Maadi rooftop converted into a makeshift yoga space. This entry was posted in Musings from the Mat, Musings off the Mat and tagged Ashtanga, Cairo, Egypt, Practice, Yoga by sisterhoodofthetravelingmala. Bookmark the permalink.